Genre/Influences: Neo-folk, industrial, neo-classical, cinematographic. Background/Info: Larrnakh is a Hungarian solo-project set up by Sörös Gergö (still active as the singer in Cawatana). It’s not exactly a solo-formation as Gergö got the contribution of several guest musicians. 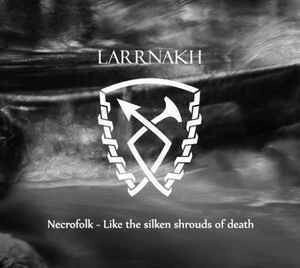 “Necrofolk – Like The Silken Shrouds Of Death” is the third album of Larrnakh. 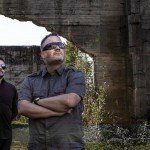 Content: The influences running through this opus are clearly a mix of neo-folk, neo-classic and industrial music plus some cinematographic passages. The debut part is a beautiful experience in sound with an artistic neo-classic approach. It progressively moves towards a mix of neo-classic and neo-folk and next moves into more industrial fields. The very last songs get back to the artistic beauty of the opening cuts, but it now all becomes more film-like with some melancholic touch on top. Some of the songs feature a few vocals adding a sort of heavenly flavor to the work. + + + : This is a beautiful and artistic album. The influences are complementary creating many outstanding songs. The composition with acoustic instruments like violin, bass, cello and the multiple piano arrangements inject an authentic touch to the work. This is a beautiful piece of music, which sounds harmonious and perfectly fitting as a soundtrack. – – – : The opening- and final cuts are simply amazing, but some of the other cuts in the midst are a little less convincing like missing the true spirit of the other songs. It however just concerns a few pieces. Conclusion: Larrnakh is not creating a new format of neo-folk, but a successful symbiosis between different genres. This work will appeal to a wider audience of music lovers who like authentic instruments. 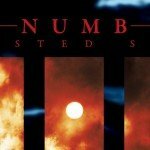 Best songs: “December”, “For A Dead Man”, “Internal Storm”, “A Dream In Grey”, “Private Passion”, “Dewdrops On My Wings”.